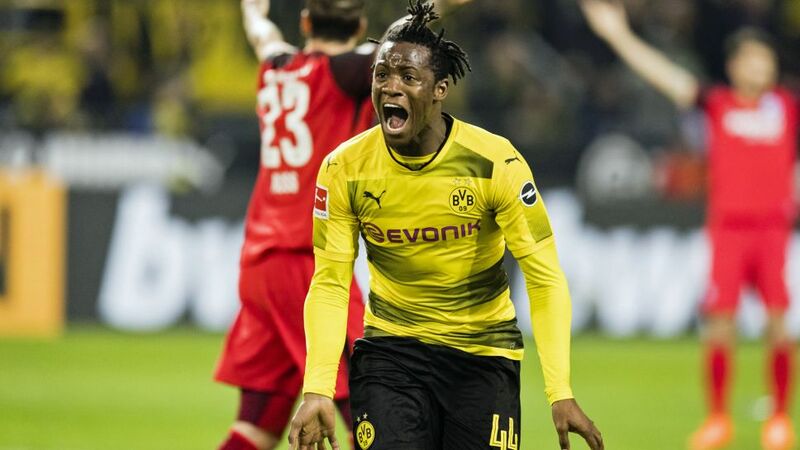 With seven goals in nine competitive appearances for Borussia Dortmund, Chelsea loanee Michy Batshuayi could not have wished for a better start in the colours of his beloved SpongeBob. "It went by in a flash. A lot of good things have happened for me in footballing terms, which has been fantastic. Hopefully, I can carry on in the same vein." "It's going to be very difficult, but I'm really pleased because we've won matches as a team and I've produced some really good performances and been very clinical. The only downside was the [draw] against Augsburg; we're all very disappointed with how that turned out. It was a very tough game both for footballing reasons and because of the weather, as it was extremely cold, but that's no excuse. We should've played a lot better." "My impressions have been really good – it's a fantastic club, and I think we can still do big things between now and the end of the season. We're still in the Europa League and everyone in the dressing room and at the club believes that we can reach the latter stages and win it. We're also going to do everything we can to finish second in the league and ensure that we qualify for next year's Champions League." "I'm a technical player, but I'm also a fighter and win lots of aerial duels. That aside, I'm obviously an attacker, so I'm a goalscorer. Needless to say, I want to do my best to contribute to the cause and help the team." "I'm new to it, but I'm a big fan because it's very forward-thinking, with a lot of fast counter-attacking, while also being physical and intelligent. It's fantastic and I'm very glad I came here." "I've seen some talk about that online and I find it funny. It's nice for all concerned: the Dortmund supporters are really pleased with us and we're happy too. We're eager to keep working hard and things like this fire our motivation to continue playing well and scoring goals. When everyone is happy, that makes it a nice environment to work in. Long may it continue." "Ooh la la! It's one of the best leagues in the world. It's very physically demanding and there are lots of fantastic stadiums, which I knew about beforehand, as well as good players. All in all, it's a great division." "It depends on the team: some are more defensive and some are more attacking. But it's a very, very good league." "I was in a hurry when I arrived because I had to give an interview, but when I saw the stadium, I was blown away – even though it was daytime. I couldn't focus on the interview; I was speaking, but my head kept turning to look at the stadium. My first match there was simply magnificent. It gave me goosebumps." "It's my style. I've celebrated with backflips before and I'd pledged to do so again if I scored, since it's something the Dortmund fans are very fond of. So, it was partly for them and partly for me." "I've got some other routines. When I score, the celebrations just come naturally to me, on the spur of the moment." "They meant both something and nothing. On the one hand, I'd already worn blond highlights before. On the other hand, they meant my hair echoed the club colours, yellow and black. However, since we had a bad match against Augsburg, I got rid of them completely, so now I'm back to just black hair."